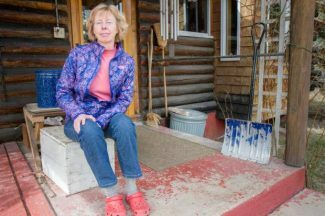 Lynn Kirchner of Carbondale is frustrated by higher health care costs in Colorado's mountain towns compared with the Front Range. TODAY: Despite — or perhaps because of — Colorado mountain dwellers’ love of hiking, skiing, bicycling and all things physical, health care costs are stubbornly stuck far above average. APRIL 4: How did western Colorado reach a point where for some people, health care costs more than a large mortgage? APRIL 5: People in the mountains use MRIs and other imaging services, as well as pathology and lab work, at three times the rate of the rest of Colorado, part of why costs are higher. 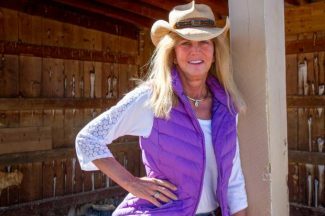 APRIL 6: Health experts in the mountain resorts and metro Denver warn critics to be careful what they wish for — tossing out all or part of the Affordable Care Act can make things a lot worse. 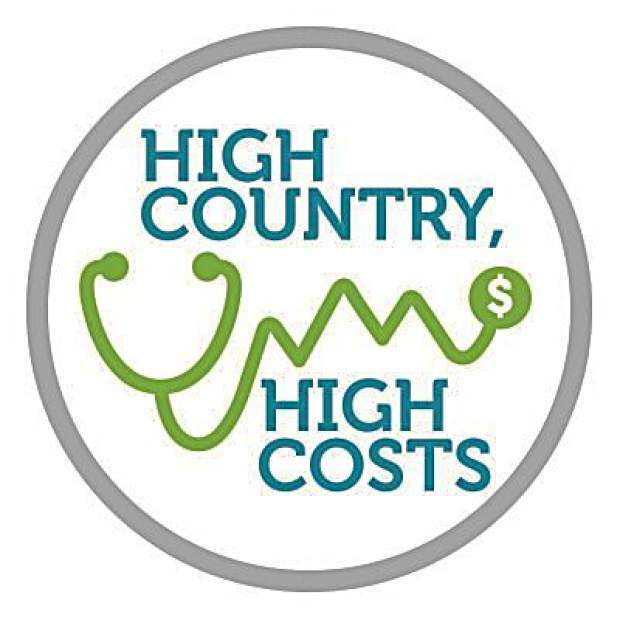 APRIL 7: Facing much higher costs, many High-Country residents wonder whether their hospital bills are justified — or whether the amenities have to be so nice. APRIL 8: Innovation, generosity and cooperation are showing some promise for tamping down High-Country health care costs. Editor’s note: This is the first installment of a six part series on health in the mountains. No, Colorado mountain resident, it’s not just your imagination. You still are paying some of the highest health care costs in the nation. Despite — or perhaps because of — the region’s love of hiking, skiing, bicycling and all things physical, Zone Nine in the Colorado mountains is stuck stubbornly at about 145 percent of average health care costs. People in Breckenridge, Glenwood Springs, Basalt, Avon and Carbondale talk of paying more for their family’s health care than they do for their mortgage — and their mortgages are steep enough, thank you very much. Health costs are driven by two main factors: price per unit — say, a doctor’s visit or a heart bypass — times the frequency of those visits. And Pitkin, Garfield, Eagle and Summit counties score poorly on the former and not so great on the latter. Getting a hip and knee replaced costs about $69,000 in the hospitals in the Colorado mountains, but about $40,000 in metro Denver. 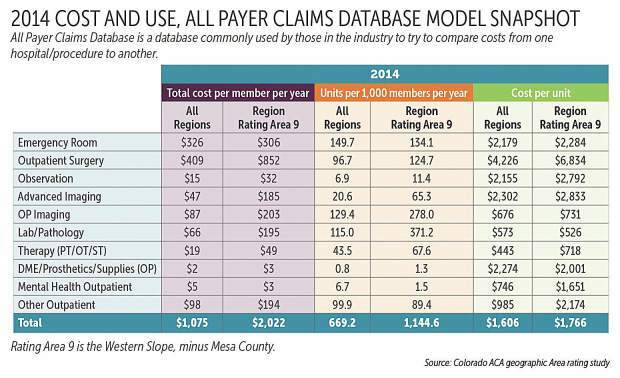 Visiting a doctor costs an average of $195 in Boulder, but $301 in the mountain resort cities. The patient may never see that bill, but it’s being paid one way or the other — by the insurance company, Medicaid or Medicare, the patient’s employer, or by the person who is without insurance. And mountain resort residents are using some services much more often than average, particularly visits to specialists and imaging tests such as MRIs and CT scans. 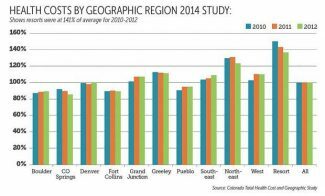 Specialist visits per patient per year average $260 in Boulder, but $602 in the mountain resorts. That combination of higher charges and more frequent usage drives up insurance costs. It’s hitting almost everybody — from the people who get their insurance from work and are seeing premiums and deductibles rise every year, to the employers who say costs are getting unsustainable, to the freelance writers and ski instructors, the self-employed and the entrepreneurs. “It’s no hyperbole to say that costs are oftentimes 300 percent to 500 percent more in the mountains than for the same services in Denver,” said William Lindsay, who chairs the Colorado Commission on Affordable Health Care. This year the western Colorado people getting especially zapped and scrutinized are the self-employed and others in the individual market who earn a bit more than 400 percent of the federal poverty level (FPL) — about $64,000 for a couple or $98,000 for a family of four — but not enough to make their premiums affordable. Rates rose for that group 30 percent for 2017, and are 40 percent higher than they were in 2015. Earn slightly less than 400 percent of FPL, and you get a nice subsidy in the form of a tax credit — knocking an average of about $225 per month off the premium. That’s because those who fit below that number aren’t supposed to pay more than about 10 percent of their income on health care — it’s one of the more popular provisions of the Affordable Care Act, which withstood the first attempt at repeal under the Republican Congress and Trump administration. But earn a bit more, and there is no financial assistance. Twenty-seven-year-olds without families price themselves out of financial assistance if they earn more than $47,500 yearly. In that case, the young person choosing a middle-of-the-road silver plan under ACA will pay $514 if he or she lives in Garfield, Routt or Pitkin counties — just about double the rate in Denver, Boulder and El Paso counties. 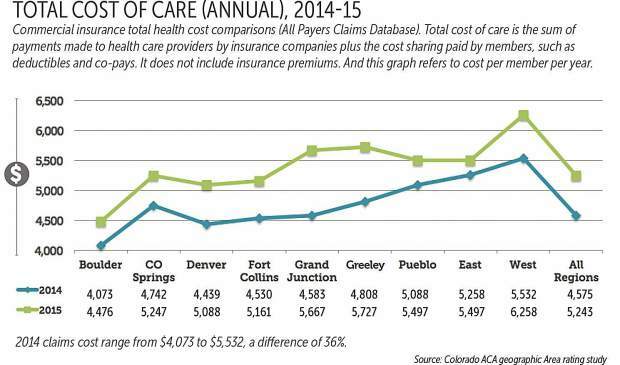 If he or she lives in Summit or Eagle counties, the monthly premiums would be about $350. Blame can be found in all directions. Some say costs are so high because young, healthy people are opting to go without health insurance, taking their chances that they will stay hale and fit — and not, say, tear an ACL on a snowboard fall. Insurance companies need healthy people enrolled to counterbalance those who are elderly or sickly. But with premiums at $500 a month for a young, healthy single person, the maximum penalty of $695 a year for not carrying insurance can seem a relative pittance. A couple years back the Kaiser Family Foundation officially declared the Pitkin-Garfield-Eagle-Summit region the highest in the nation for health care costs. The average inpatient cost at St. Anthony Medical Center in Frisco was $786 — 61 percent above the state average, according to the Colorado All-Payer Claims Database. And in Pitkin County, costs per patient per year for doctors and other medical professionals were 2.2 times the state average. That’s what you get when the cost of living is high, when insurance choices are few, when there is usually just one hospital per county, and when there is a big incentive to order imaging tests. Amy Downs, senior director for policy and analysis at the Colorado Health Institute, notes that the machines to do MRIs and CT scans pay for themselves and generate profit. The relentless rise in health care costs “has nothing to do with the Affordable Care Act,” contends Lt. Gov. Donna Lynne, who led a task force last year examining disparate premium costs throughout the state. “It has to do with all of us getting older, living longer and having the expectation to live in a very healthy state” into our 80s and 90s, hiking, skiing, bicycling. Indeed, the number of Americans living with knee and hip replacements doubled between 2000 and 2010, according to the Journal of Bone and Joint Surgery. The prevalence of Americans in their 80s having one or the other replacements grew tenfold between 1980 and 2010. 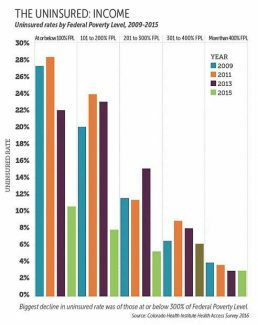 Hip and knee replacements are now a huge cost driver for the health care system. The fact that they cost about 40 percent above the mean in the mountain valleys of Colorado exacerbates the costs and aggravations here. The drugs and surgeries and high-tech imaging tests that extend our lives and cure diseases “are wonderful and they’re also very, very expensive,” Lynne said. Repeal of the ACA won’t change that, she said. The ski resort counties are a world apart. Pitkin, Summit, Eagle and Routt each have only one hospital — Garfield has two — yet each of the hospitals has to be big enough to handle the influx when skiers multiply the size of the towns every winter: year-round overhead for a seasonal rush. 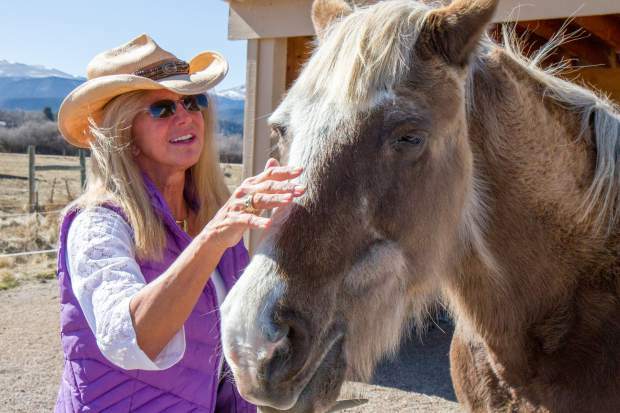 Vail and Aspen have their slices of millionaires and billionaires who won’t blink at health care prices and who, unconsciously or not, up the demand for luxuries and amenities. Yet the year-round residents are mostly average Joes and Janes, earning almost enough to pay for the expensive housing, food, clothes and necessities. Many of them look askance at the valet parking and grand pianos at the small-town hospitals, the robotics labs and world-class orthopedics units. All those dichotomies help push up prices. Lynn Kirchner, a real estate broker from Carbondale, said “it drives me crazy” that she can get an MRI in Denver for $500, one in the valley for $1,000 if she pays cash, but that her local hospital charges $3,000 to those without insurance. She knows that smaller volumes in small towns lead to higher prices, which leads to less competition, which leads to fewer insurers, which leads to providers and hospitals having the clout to charge yet higher prices.